Cut vegetables in small pieces and heat oil in skillet on low-medium heat. Add tomatoes and stri. When softened up, add onions, then peppers, and frequently stir. Add salt to taste. When done, may serve with roasted yams and beans, as a spread on rye bread, or even as pasta sauce. Why should you eat cooked tomatoes? Besides the delish taste, tomatoes are rich in lycopenes and diets rich in tomatoes have been shown to reduce the risk of breast cancer, prostate cancer, pancreatic cancer and heart disease. 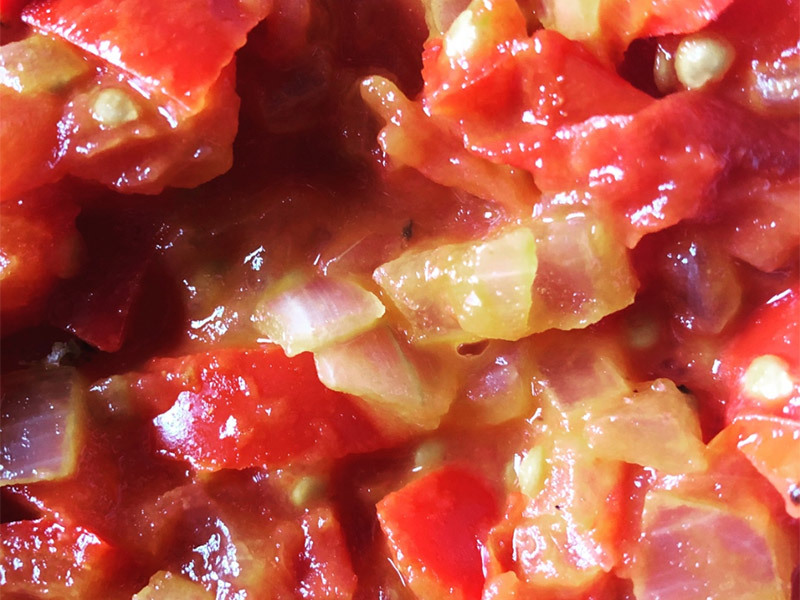 Lycopenes are potent antioxidants and are more bioavailable when cooked. Unpeeled tomatoes are preferred as their skin is rich in beneficial phytochemicals.